It was a snowy afternoon !! Looking at those white snows in a gloomy, gray weekend , something just popped into my mind !! How about making pizza ?? But not any ordinary one !! How about a bubble pizza with cheese stuffed garlic balls !! YUUUUUUUUUUUMMMM!!! * Peel and smash the garlic cloves . Heat olive oil with smashed garlic at medium low flame until bubbles form around garlic . Now reduce the heat to low and cook for another 5 minutes . Careful the garlic must not get brown . Let the oil cool and use it anytime you want it . 1.Mix all the ingredients except oil . Be careful while adding luke warm milk and water . If you use too hot water the yeast might get killed , and if you use room temperature or cold water, the yeast won’t wake up !!!!!! In both case the dough will not rise and everything will go in vain . So always use luke warm water in any recipe where you have yeast as an ingredient. Make a soft dough . If you make the dough hard , the bread will be hard , so make it a soft dough . 2.. Knead well . The dough will be very sticky . Now add the oil and form the dough into a round ball . Now it’s easier to work with the dough. Knead very well . The more you knead, the softer bun you get . Knead at least 8-10 minutes .Put the dough into a closed lid box and place it in a warm place . It may take an hour or more to get the dough double in volume . If it becomes fluffy and double in volume , the dough is ready to make the bun. Sometimes it may get longer time to rise . Sometimes it takes almost 2 and half hour to rise up and to be fluffy . So don’t do anything until it rise up in volume and becomes fluffy . 4. Punch down all the air form the dough . Now divide the dough into two equal portion . 5.Now working with one ball at a time , apply some flour on your hand and flatten the ball into a disk using your hand . Now on a lightly flour dusted surface roll out the disk into a bread , 1/2( half inch) thick. Don’t use any extra flour . You can ethe dough to shape the pizza base . Now transfer it to the baking sheet . Rub the surface of the bread with grated garlic. Rub with tomato sauce . Add the topping of your choice . Sprinkle the Italian seasoning . Add the cheese . 6. Now with the other half of the dough,mix the grated garlic and Italian seasoning with the dough very well and make small balls to put around the pizza base . Flatten each ball and put some cheese into it. Reshape the ball . Make all thes balls like this . All of them should be of same size . Place the balls closely to each other but not touching each other. Do keep some space . Dont place them so close as they touch each other because after second rising they will rise and spread , that time they will touch each other , and that is desired . But if you place them touching each other , the shape will not be good . Cover with a wet cloth for 20/ 30 minutes and let it rise again a bit . At that time you will see the balls are touching each other by rising and spreading . Perfect !!! In the mean time pre-heat your oven to 400 FH or 200 Centigrade.Now brush the garlic infused olive oil over the balls . 7. Bake for 15- 20 minutes . Don’t over bake . That would dry out the pizza . Stromboli !! this is kind of folded Pizza , ingredients though Italian, usually salami , pepperoni , provolone cheese , mozarella, it is indeed originated in USA back in 50s and named after the famous Ingrid Bergman starred movie “Stromboli” by the Romanos in Philadelphia . For prepared beef mince , I boiled the mince with soy sauce , little salt and ginger-garlic paste until dried out. Then , in oil , added the mince , and added little oyster sauce , carrot , onion and chopped capsicum and chilies . For Shredded chicken , just boil the chicken breast with soy sauce , ginger paste and whole black pepper . Dry out the water and shred the chicken pieces . 1. Combine all the ingredients ( that is flour , yeast , sugar , salt , milk powder , egg, 1 tbl spoon of ghee )except 4 tbl spoon oil . Now make a soft dough . Don’t make a hard , tight dough . The softer is your dough the , softer is the bread . So , you may need a little more milk too . First , the dough may seem very sticky . Now add the oil and knead . Now it will be easier to knead . Knead very well, so that the dough becomes glossy and smooth . The dough will come together and won’t stick any more . Knead for at least 10 minutes . The more you knead , the softer bread you get . If you find little sticky at the end , you may add little oil . Form the dough into a ball and rub some oil over it . 2. Now put the dough in a greased , closed lid box and place it in a warm place .. It may take an hour or more to get the dough double in volume . If it becomes fluffy and double in volume , the dough is ready to make the Stromboli. Sometimes it may get longer time to rise . Sometimes it takes almost 2 and half hour to rise up and to be fluffy . So don’t do anything until it rise up in volume and becomes fluffy . 3. Punch down all the air form the dough . Now roll out the dough into a square . The quantity mentioned in the recipe will make two 12″ long stromboli .Don’t use too much extra flour to roll out . It may make your bread hard . Just roll them on a slightly flour dusted counter top . 4.Spread pizza sauce over most of the dough, leaving a 2 inch border. Now arrange the stuffing demonstrated in the pic . 5. Brush with olive or any other vegetable oil , then brush with beaten egg . Sprinkle with Italian seasoning . Cover with a cling film and let it rise for another half n hour . 6. In the mean time pre-heat the oven at 400 FH or 200 centigrade . Bake the Stromboli for 15-20 minutes . it took me 17 minutes . May vary oven to oven . But don’t over bake , that would dry out the bread . 🙂 After removing from the oven rub some butter over it for soft and glossy look . This would keep your bread soft for a longer time . 1. I have many followers living in Bangladesh and ask me to give the ingredients available in Bangladesh . Trust me , you will find every ingredients mentioned above in Bangladesh in big super stores . If you don’t find Provolone cheese , leave it . Mozzarella , cheddar is available . 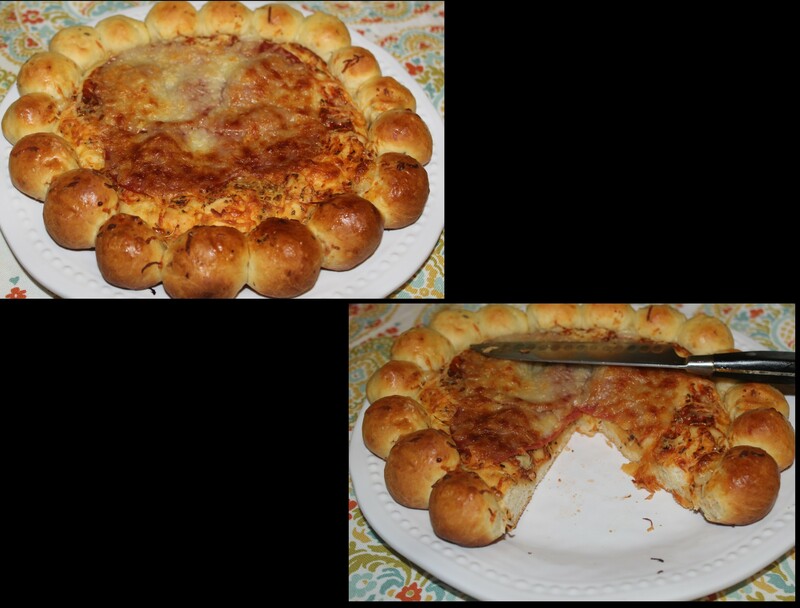 For Pizza Pin wheel , plese follow the following link for making the dough . 1. I used litle wasabi sauce too with the pizza sauce . Add same finely grated garlic to enhance the flavor . Believe me Wasabi sauce and garlic together with pizza sauce make it yummier . 2. While cutting the roll , don’t press too hard . Just cut gently . 3. After cutting them , cover them with a cling film or plastic to rise a bit . For about 20 minutes . Bake the pizza pin wheels in a pre heated oven for 15 minutes at 400FH . Don’t over bake . That may make it hard . 4. If you want to preserve them , after the second rising , cover them with cling film and preserve them in the refrigerator . Any stuffing of your choice . I used prepared beef mince , spinach- sauted in little oil with onion and garlic , and cheese ( cheddar, mozarella ). 2. Now put the dough in a greased , closed lid box and place it in a warm place .. It may take an hour or more to get the dough double in volume . If it becomes fluffy and double in volume , the dough is ready to make the bun. Sometimes it may get longer time to rise . Sometimes it takes almost 2 and half hour to rise up and to be fluffy . So don’t do anything until it rise up in volume and becomes fluffy . 3.Punch down all the air form the dough . Now roll two same sized round disk or roti . Don’t use too much extra flour to roll out . It may make your bread hard . Just roll them on a slightly flour dusted counter top . 5. Preheat oven to 400 FH for 20 minutes and let the bread rise these 20 minutes . Just before you place it in the oven brush with egg wash and sprinkle some sesame and black seed in the middle . Bake for 20-25 minutes . It took me 25 minutes . Don’t over bake . That may cause the bread to dry out .